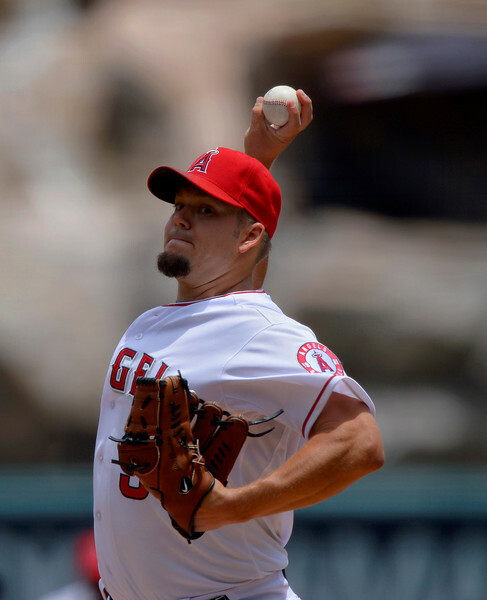 Joe Blanton’s next start for the Angels is to be determined. Angels manager Mike Scioscia wouldn’t commit to Joe Blanton taking his next scheduled turn in the rotation Saturday in Oakland. “We’re working on a couple of things now and we’re going to see where we are,” Scioscia said. Blanton has allowed more home runs (24) and hits (157), and lost more games this season (13), than any major-league pitcher. Monday’s loss was the 10th game, and fourth in a row, in which Blanton has pitched fewer than six innings and allowed more than three runs. Time Warner, Fox teaming up to broadcast 63 Angels games in Spanish. Time Warner Cable announced it will carry Spanish-language telecasts of 63 Angels games beginning tomorrow night. Fox Sports Networks will produce these games for distribution by local Time Warner Cable systems to its customers, which will air locally on channel 858. Daily Distractions: Mike Trout’s celebrity grows, Vladimir Guerrero’s quest continues. Not long ago, fans voted online to determine who is “The Face of Major League Baseball.” The winner, of course, was Ezequiel Astacio Joey Votto. Wait, you didn’t remember who won the most important bracket of March? It’s another drop in the growing tide of Trout’s national celebrity. This off-season, he was featured on the cover of ESPN The Magazine, GQ and Men’s Health. You have to figure that he’ll get more exposure before he gets less. Ryan Seacrest seems to agree. It’s also a refreshing affirmation that it’s possible to be a star simply by being really good at what you do. Trout isn’t as flashy as Harper, doesn’t play in as large a market as Cano, and hasn’t had as much time to establish himself as Price or McCutchen. He’s just a really good baseball player — maybe the best in the game — albeit one with a .313 on-base percentage (if you want to hold up his three-game sample size from 2013). Playing in Los Angeles of Anaheim helps, too. Daily Distractions: Making sense of Yu Darvish’s near no-no. On an off-day for the Angels, the Texas Rangers and Houston Astros created a compelling night of action in the American League West on Tuesday. 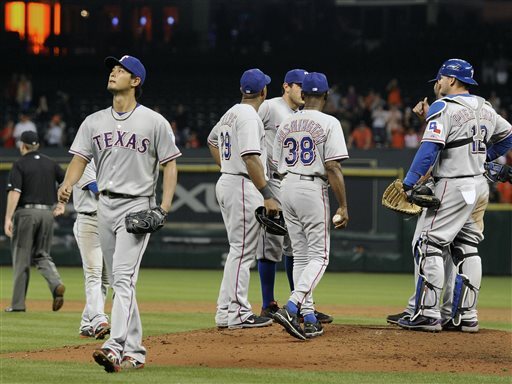 The pertinent question for the Halos: Are the Astros that bad, or is Darvish that good? The right-hander joined a list that includes Dave Stieb, Mike Mussina and eight pitchers you might not have heard of who have lost perfect games in the ninth inning. Anyone can do it, even Armando Galarraga. Ken Rosenthal and Mark Mulder blamed the Astros. Jean-Jacques Taylor and Bo Porter credited Darvish. 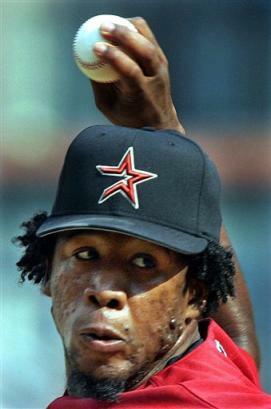 Alan Ashby, the Astros’ color commentator, reacted with racial overtones (I think). The Angels will find out soon enough whether Darvish’s stuff is for real. If he pitches on regular rest, he’ll face the Angels (and Jered Weaver) on Sunday in Arlington. The game is scheduled for a 5 p.m. national broadcast on ESPN2.